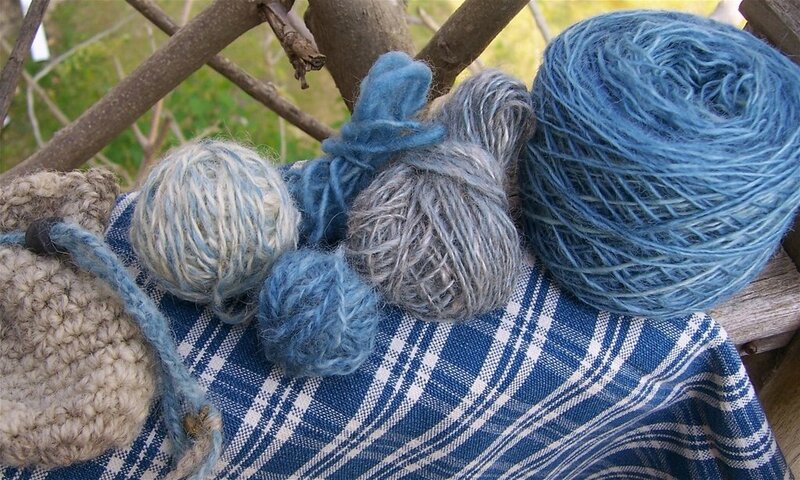 I have this little collection of indigo yarn, bits left from my weaving days. All the blue in these yarns was dyed by my friend V, who is an extraordinary natural dyer and weaver (oh, her shawls…). The plaid cloth is a piece of cotton from Baltimore, made sometime just before 1900 — still sturdy, and still quite blue. One of these days I am going to ask V to dye some yarn for me so I can make a sweater or a shawl, and so I can wrap myself in the magic of indigo. What a cozy pile of Indigo yarn & the cloth is beautiful! lovely picture – I grew some indigo of my own one year – but never did end up using it as dye. It’s a wonderful plant all by itself.